Typically at MEMS Executive Congress, both US and Europe, we have panel topics that fit neatly into neat little packages like “MEMS in Consumer” or “MEMS Automotive.” This year in planning for our US event, our steering committee wanted to shake things up a bit to delve into what’s next for MEMS (beyond iPhone and Galaxy, Kinect, Kindle and name-that-new-and-exciting automotive safety or driver-assist application). After all, the theme of MEMS Executive Congress US is “MEMS is in the mainstream—so what’s next?” And what’s next is emerging technologies. Our “MEMS in Emerging Technologies” panel will help to foretell what’s next. Staffed by experts who are at the forefront of emerging technologies in their respective fields, our panelists, these are the guys who are doing the “blue sky” thinking; they are tinkering in the lab and thinking the “what if” questions, and yes, they are doing it with MEMS. I am thrilled to have as panel moderator, Steve Whalley, director, Sensors, Intel Architecture Group, Intel Corporation. Steve and I recently spoke about MEMS in Emerging Technologies and he gave me an introduction of our impressive panelists and a sneak peak into what the panelists will be discussing at MEMS Executive Congress US 2012. Q: Steve – I am impressed by the combination of research and real-world experience of your panelists. Can you tell me more about who they are? A: Jon Kindred is senior director of signals and systems, Starkey Laboratories. Jon provided technical and managerial leadership during Starkey’s ascent in becoming best in class in many significant signal-processing features. Jon is joined by Hughes Metras, vice president, strategic partnerships, North America, CEA-LETI. Hughes has been involved in microelectronics, addressing power conversion for industrial, automotive and PV applications, and solid-state lighting, as well as sensor technologies for healthcare and environmental issues. 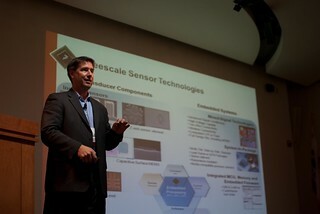 And last but certainly not least is Todd Miller, lab manager, MicroSystems and MicroFluidics, GE Global Research. Todd has focused on design and development of high-volume manufacturing devices and systems in safety-critical applications, with a concentration in system engineering, MEMS design and establishing design and quality control methodologies to support high-volume production. Last week, I shared with you an introduction to MEMS devices and how most of us use these devices every day—without even knowing. This week, GE asked technology enthusiasts in the twitter space to share what they think is the greatest invention of the past century. I was reading through this list as I was writing this blog post, and I couldn’t help but think how a majority of the technologies in this list utilize MEMS! From video games to computers to the telephone, MEMS devices have been a part of some of the greatest technologies in the past 100 years! Before we share with you next week what we are doing to further revolutionize MEMS devices, we decided to give you a peek inside our cleanroom at GE Global Research and to show you where we developed our metal MEMS technology and make MEMS devices. One of the unique aspects of our MEMS device technology is that we use metals, in place of traditional silicon, to form robust and reliable devices. We take advantage of the metal’s properties, such as conductivity, to significantly advance device performance and enable new MEMS device capabilities. Check out the video below and feel free to leave any comments or questions. Don’t forget to check out the blog next week when we finally reveal what we have been working on in the MEMS space. For those of you who have heard me talk about MEMS and Medical/Quality of Life (QoL applications – I don’t shy away from calling it “God’s work.” I still get misty-eyed when I think about my friend’s ten year-old daughter, Anna, who has type 1 Diabetes. Last year I told Anna about technology from MicroCHIPS that (thanks to the wonders of MEMS) will someday enable her to seamlessly and automatically monitor and dose her insulin without having to prick her finger and then calculate and administer a dose before every meal or snack. She’ll get her dignity back and she’ll improve her quality of life. The Holy Grail in medicine is not diagnosing Diabetes, Alzheimer’s or even obesity; it’s figuring out what’s next and how to deal with it. MEMS technology can and will help to navigate that path. With MEMS technology fundamental to new medical/QoL devices and applications, understanding opportunities in this rapid-growth market is more important than ever. At MEMS Executive Congress US 2012, we’ve lined up a panel of industry experts to discuss how MEMS continues to play a critical role in the development of new technologies that assist with patient monitoring, diagnostics, therapy and portable health care. While micro-electromechanical systems (MEMS) industry leaders such as STMicroelectronics, Texas Instruments, Hewlett Packard, Robert Bosch and Kionix rely on their captive fabs to meet volume production, the movement toward fabless and fab-lite models continues to gain ground. InvenSense, for example, has always been a fabless company, and even powerhouse Analog Devices uses a hybrid approach, choosing internal and external foundries to produce MEMS die for inertial sensor products. Despite the advantages of having a captive fab, which supporters say includes greater control over both capacity and intellectual property (IP), the primary disadvantage—cost—has spurred the use of third-party foundries. In addition to cost savings, companies work with third-party MEMS foundries for a variety of reasons. They may want to prove a design, prototype a design that is already proven, or mass-produce a MEMS device. With a multitude of options, choosing a MEMS foundry is not a simple decision. Pure-play MEMS foundries, such as Silex Microsystems, Micralyne, Teledyne DALSA, Asia Pacific Microsystems, Innovative Micro Technology (IMT) and Tronics do not offer design services but they do offer volume production. Partially captive foundries offer another alternative. They will fabricate MEMS die for outside customers when there is excess fab capacity. White says that a foundry partner with the right experience can help companies to overcome common technical and logistical challenges—such as coupled physics, moving parts, environmental exposure, and test and packaging challenges. MEMS also presents design challenges that foundries cannot meet alone, according to White. With few formal standards, diverse tool sets and foundry-specific design rules not yet available for existing simulation packages, companies need good design and process engineers to work with the foundry throughout the process. MIG is very excited to announce that this article was featured in the “Top Stories” section of EE Times today. After hearing the beautiful sound achieved with the high-performance MEMS microphone that Rob O’Reilly of Analog Devices demonstrated at Sensors Expo 2012, I have the same kind of anticipation for what kind of rock star(s) this MEMS device might unleash. Because what makes this MEMS mic so different is that the quality of the sound is so clear and perfect that it can make anyone sound like a rock star, sans the million-dollar recording studio. What’s more, my sources at Analog Devices tell me that this new “smart” MEMS is also lower cost. What makes it smart? According to the folks at Analog Devices, their MEMS microphone technology provides a higher signal-to-noise ratio for better near and far-field performance, flatter frequency response and noise rejection, ultimately producing better quality sound. Throw beam forming, directionality and proximity response into the mix and you have a microphone for a wide range of applications. More than 50 years ago, Richard Feynman urged the pursuit of micro and nano scale devices. 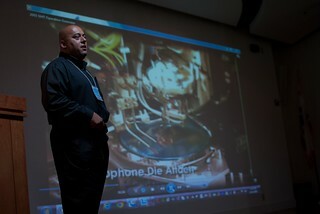 This pursuit has brought significant advances in micro and nano electronics made possible by the transistor. More recently, MEMS devices, built from similar materials and leveraging the same tools set at silicon based electronics, have made their way into existence. 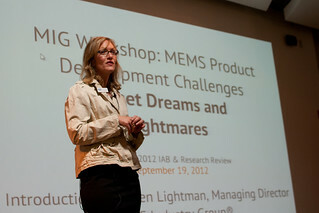 There is even an industry group dedicated to advancing MEMS. Just a few weeks back, the Managing Director of the MEMS Industry Group stopped by our research center to learn more about our ongoing research. About 15 years ago, the New York Times published an article about the future of an exciting technology called MEMS. We are living the realization of MEMS technology and today, GE is on the verge of enabling a whole new revolution in MEMS applications. But I digress. First of all, you are probably wondering what MEMS devices are.